This is part five of The Crimson’s five-part series analyzing exit polling data collected during Harvard’s 2018 unionization election. Read the first part here, the second part here, the third part here, and the fourth part here. Students who voted “Yes” to unionization were two-and-a-half times more likely to disapprove of how Harvard handles issues of discrimination and sexual harassment than were students who voted “No,” according to an exit poll conducted by The Crimson. Of those who reported disapproval, the vast majority—85 percent—voted in favor of unionization. By contrast, less than half—43 percent—of those who reported approval voted to unionize. Of all respondents to The Crimson’s survey, students studying at the Harvard Kennedy School, Harvard College, and Harvard Law School were most likely to indicate they disapprove of the University’s handling of discrimination and sexual harassment. Each school saw over 60 percent of affiliated respondents indicate disapproval, respectively. Overall, female respondents were roughly 20 percent more likely to report disapproval than were male respondents. A majority—53.5 percent—of women respondents indicated they disapprove of Harvard’s procedures for dealing with discrimination and sexual harassment. By comparison, 41.6 percent of male voters and 40 percent of gender-nonconforming voters did the same. 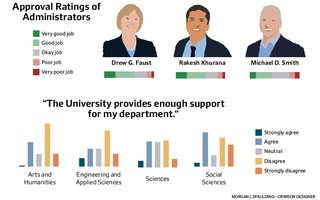 The Crimson’s survey also asked voters to give their opinions of individual administrators. 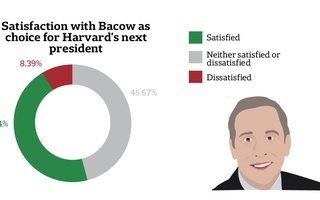 A plurality of respondents indicated they approve of University President Drew G. Faust—48.6 percent. Reweighting responses by the official election vote count suggests that 50.5 percent of those who cast ballots in the election approve of Faust. Pro-union survey respondents were over six times more likely to disapprove of University Provost Alan M. Garber ’76 than were their anti-union counterparts. Eligible student assistants cast ballots April 18 and 19 to determine whether Harvard Graduate Students Union-United Automobile Workers would earn the right to collectively bargain with the University on their behalf. The final result showed 1,931 votes in favor of unionization and 1,523 against—a tally certified by the National Labor Relations Board Monday. 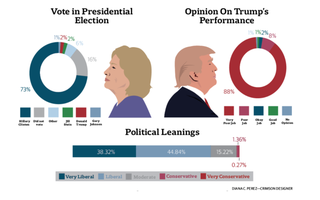 The Crimson conducted an exit poll on both days of the election, stationing reporters at the three polling locations in Cambridge, Longwood, and Allston for 78 percent of all hours the sites remained open. Reporters collected surveys from 1,295 voters, representing over a third of the total voting population. One exit survey question asked whether respondents approve or disapprove of the University’s handling of issues of discrimination and sexual harassments. Overall, 47.2 percent of respondents indicated they disapprove, 20 percent indicated they approve, and 32.8 percent indicated they have no opinion. In the weeks up to the election, some union organizers argued establishing a union in Cambridge would help students advocate for better protections against sexual harassment. Concerns over sexual misconduct recently spiked on campus—in March, the Chronicle of Higher Education reported that at least 18 women are accusing Government Professor Jorge I. Dominguez of repeated acts of sexual harassment over a 30-year period. Though administrators first sanctioned Dominguez for sexual misconduct in the early ’80s, he later rose through Harvard’s administrative ranks. Following the Chronicle’s reporting, graduate students circulated a series of open letters expressing disappointment with how Harvard dealt with Dominguez across the decades. Dominguez announced his retirement in March. The University has launched a Title IX investigation into the matter and the Government department has formed a committee to examine the culture that allowed Dominguez’s behavior to persist unchallenged for more than 30 years. The Dominguez case and the #MeToo movement more broadly figured prominently in HSGU-UAW’s pitch to voters. Our Harvard Can Do Better, a campus anti-sexual assault group, endorsed the union in March and participated in organizing efforts in the weeks leading up to the election. The union also held events about the work of unions in combating sexual harassment. Of survey respondents affiliated with the Graduate School of Arts and Sciences, Humanities and Social Sciences students were more likely to report disapproval of the University’s handling of sexual harassment and discrimination than were their counterparts in the Sciences. Specifically, 50 percent of respondents from the Arts and Humanities division and 65 percent of respondents from the Social Sciences division reported disapproval. By contrast, 34.9 percent of respondents from the Sciences division and 39.7 percent of GSAS students from the School of Engineering and Applied Sciences reported the same. Another survey question asked whether respondents hold a favorable opinion, an unfavorable opinion, or no opinion of Faust. Just 13.9 percent of survey respondents reported an unfavorable view of Faust. Around 49 percent indicated they view her favorably, while 37.5 percent said they have no opinion of the president. Opponents of unionization were more likely to report approval of Faust than were supporters: 60 percent of survey respondents who voted “No” indicated they approve of the president, while 43.2 percent of “Yes” voters did the same. Faust last gave an opinion on the issue of unionization in Sept. 2015, marking her only public remarks on the issue to date. At that time, Faust said she disapproved of the effort to unionize, arguing a union would change the nature of the “mentoring relationship” between graduate students and faculty. Asked for their views on Garber, a majority of respondents to The Crimson’s exit poll reported they have no opinion of the administrator—61.9 percent of pro-union voters and 61.6 percent of anti-union voters did so. Anti-union voters generally held more favorable views of Garber than did pro-union voters. Of respondents who voted “No,” 34.5 percent indicated they have a favorable opinion of the Provost. Of respondents who voted “Yes,” 12.3 percent did the same. Garber has played an active role in providing information about unionization since Harvard’s first unionization election in 2016. At the time, he wrote an email to students defending the University’s appeal to the National Labor Relations Board. In the run-up to both elections, Garber sent emails highlighting resources Harvard provides for graduate students absent a bargaining unit. During both elections, union organizers have criticized Garber’s communications to students, arguing his missives misrepresent graduate students’ ability to advocate for policy changes.